The Christmas period in Europe is marked by some fairly bizarre and decidedly un-Christian traditions, although given that this has been a festive period long before christianity hit the scene these are perhaps unsurprising. Although sometimes savage and alien, they give an insight into the world of spiritual empiricism which formed ancient indigenous cultural and religious philosophies and practices. 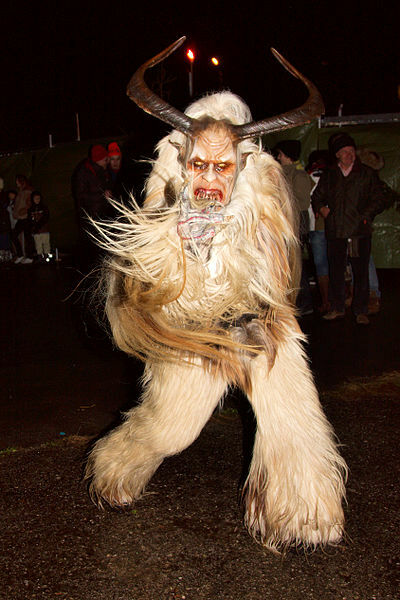 The fact that many of these traditions enjoy a plasticity and interchangeability of date and can run anywhere from Hallowe’en (31st October) through to Epiphany (6th January) demonstrates perhaps that they are first and foremost midwinter festivals, with roots seated deeply in the ancient pagan world and its beliefs about ancestors, cyclicity and divine manifestation. The ‘Christian Santa’ is based upon St Nicholas of Myra – an early Christian saint from what is now modern Turkey. His festival is attached to the 6th December on the Gregorian calendar, yet by the Julian calendar it lies on the winter solstice. That he became a popular saint all over Europe is indicative of the ability of his traditions to supplant pagan ones, and in the Low Countries he became known as ‘Sintiklaas’, from which we get the name ‘Santa Claus’, and he had an elfen helper – Swarte Piet or Black Peter, who became a character accompanying St Nicholas in the religious festival processions typifying the festival in the Netherlands. The character is immediately identifiable as he has his face blackened. Those following my blog or knowledgeable in ancient Greek history and mythology will recall that the male satyroi celebrants of the midwinter Dionysia in Greece during the 1st millennium BC would blacken their faces with wine lees at the procession of the god’s epiphany, and this appears to be a continuation of such a practice. Like the Dionysian satyrs the purpose is entertainment and the bestowal of gifts. 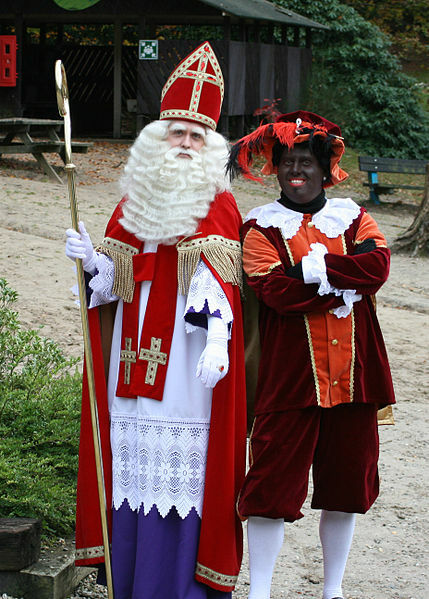 Piet and his boss generally arrive in their processions from a far off land, by boat – another link to Saturn and Poseidon, as well as to Dionysus. 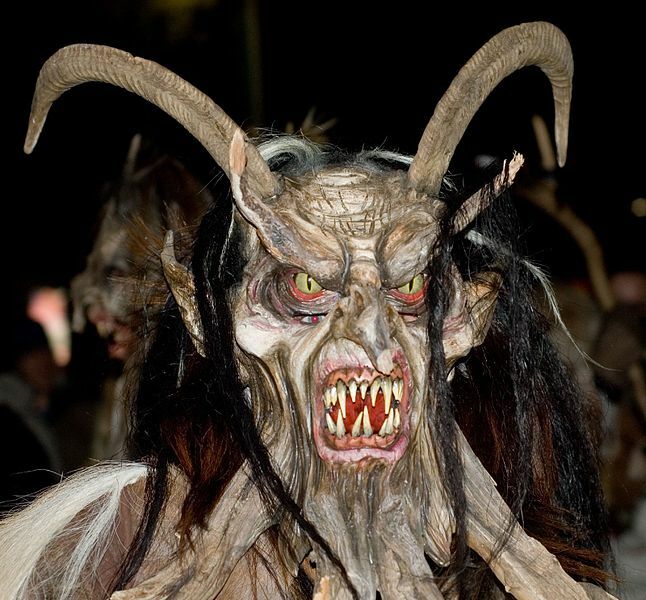 December 5th (St Nick’s eve) and the first two weeks in December are associated with St Nicholas in Bavaria and Austria, and as in the Netherlands the saint is accompanied in his processions by an outlandish sidekick, who is either his ‘helper’ or antithesis: Krampus. Perchtenlauf processions are held just after Christmas in the period up to and including Epiphany (6th January or ‘Twelfth Night’). They occur in Southern Germany, Austria and Slovenia (where Mother Perchta is known as Pehta Baba). 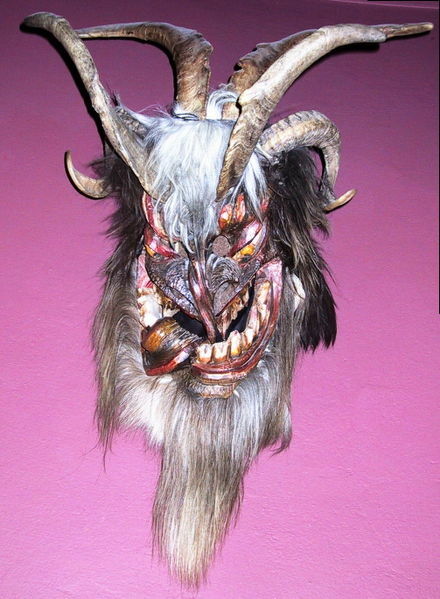 Like the Krampus traditions of early December, they involve the dressing up as masked characters, generally divided by their appearance and behaviour into the Schönperchten (“beautiful Perchten”) who wear mild-faced masks topped with floral or decorative crowns, and the (arguably much more popular)Schiachperchten (“ugly Perchten”) who correspond in appearance and behaviour to Krampus and delight in causing a good ‘scare’. The mask of a Percht – typically worn at epiphany festivities. Hailing from the Val Camonica region of the Italian Alps is an ‘Epiphany’ tradition corresponding to those of the Perchten further north and east. 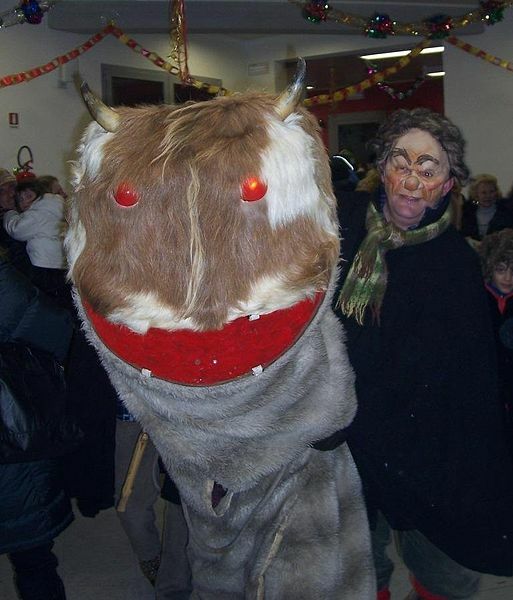 It involves a person dressing up as a wild creature called the ‘Badalisc’ or ‘Badlisk’ (i.e. – Basilisk) who is ceremonially ‘captured’ out in the countryside by a band of masked characters who parade it in the village of Andrista where it is ‘made’ to recount a rhyme containing humorous gossip and predictions for the coming year etc in return for its ‘release’ back into the wild. The event is marked by popular celebration and feasting and is an annual crowd-pleaser. It may be a remnant part of a wider regional (e.g. – Milanese) tradition of public performance or publication of satirical or excoriating rhyming poetry known as Bosinada, which offered a kind of pre-Epiphany ‘purgation’ of community woes – what might be called a ‘roast’ by contemporary American comics. Upon examination, it becomes apparent that such midwinter satire traditions appear in the ancient cultures all over Europe, and ultimately relate to the Rural Dionysia of ancient Greek culture! The ‘Badalisc’ of Andrista, Val Camonica, north of Milan. The ‘Basilisk’ of Greek legend was, by its name, the ‘King of Snakes’ and represented the figurative primal serpent often encountered in ancient European mythology. The Camonica valley was a Celtic region up until it Latinised in the 1stC CE with Rome’s northward expansion. The tradition of capturing a wren at midwinter and parading it tied to a pole is peculiar to Atlantic Europe and has been recorded in Spain, France (at Carcassone – former stronghold of Catharism) and (in particular) in Ireland, Wales and the Isle of Man. The reason for this distribution is unclear, although it seemingly corresponds to historic sea-routes by which ancient cultural traits have been proven by archaeologists to have spread in this region. ‘Wren Boys’ procession at Dingle, Co. Kerry, Ireland. 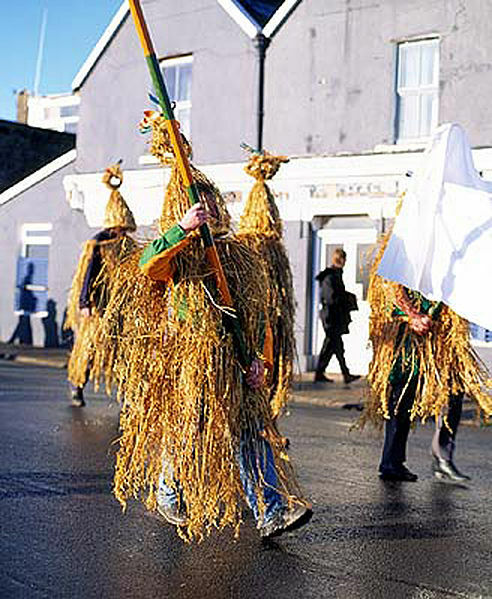 The Irish ‘Wrenboys’ who lead the procession of the bird wear outlandish straw suits and masks, primitively evocative of the shaggy Perchten of Austria, although not quite so fearsome. In the Isle of Man, such costumes were not recorded, although outlandish garb of some sort was known – boys would wear black coats in the early 20th century. 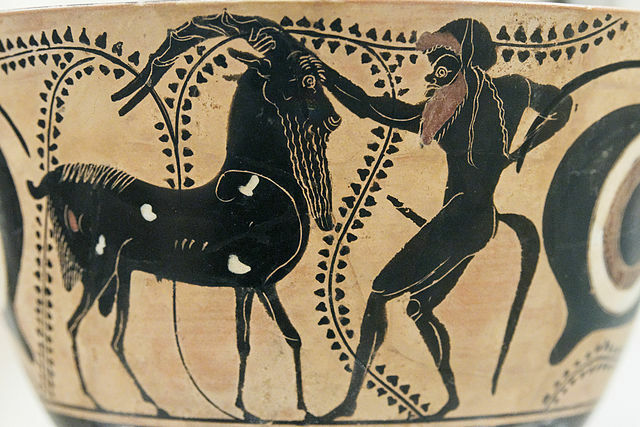 Black, bestial satyrs were the retinue of Dionysus in the Dionysia festival of ancient Greece. Image from an Attic vase 6th/5thC BCE.